Times like these make us look for useful lessons from the past. Ive always thought that a fascinating  and instructive  exchange occurred during the signing of the 1978 Camp David Accords, brokered by President Jimmy Carter. Israels Menachem Begin and Egypts Anwar Sadat were two old soldiers and adversaries. As a break from the tense peace negotiations, Carter took them to the nearby Gettysburg Battlefield. They walked the path of Picketts Charge, which took place on the final day of the battle. Picketts heroic frontal assault against the Union army, ordered by General Robert E. Lee, was a pure disaster. The Confederates were forced to retreat, leaving thousands of dead behind. At the end of their walk, Sadat broke down in tears and extended his hand to Begin saying, No more war! The horror of the charge came alive in Sadats imagination as he walked that once-bloody field. The Middle East is still waiting for peace, but at least for a moment, a mere historical narrative had turned into a lived and transformative experience. Pilgrimages to holy sites can have the same effect. 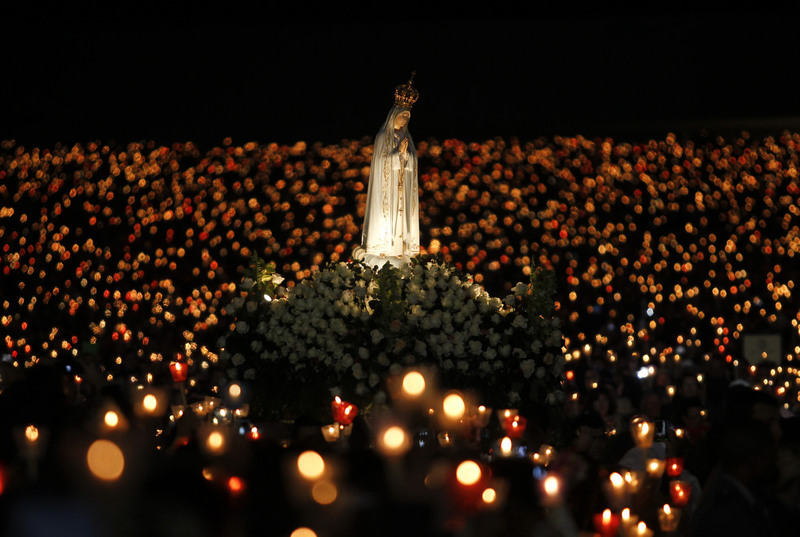 Many Catholics have grown up with the story of Our Ladys apparitions at Fatima. As a child, I myself was deeply impressed by the whole phenomenon  especially the vision of hell  but over time it turned into a kind of cartoonish memory for me. The Fatima devotions were, after all, popular piety, declared worthy of belief by the Church. But if belief was possible, so perhaps was skepticism. The more reliable path to understanding the teachings of Christ is through the study of theology and an orthodox practice of the Faith. But a pilgrimage to Fatima reignited my interest and allowed me to reassemble its remarkable pieces. The Guardian Angel of Portugal appears to the children in 1916  exactly a century ago  an appearance they keep to themselves for fear of ridicule. In 1917, Our Lady regularly appears to the children on the 13th of each month, May to October. Her message is simple: pray the rosary and continually offer penances for the conversion of sinners and world peace  or else. She entrusts three secrets that in time are revealed: The vision of hell for unrepentant sinners (most commonly for sins of sexual impurity); a new world war to be followed by the spread of the errors of Russia; and that the Holy Father would suffer greatly. Some may chalk up the apparitions to the overactive imaginations of the children, and mass hysteria followed by historical coincidences. But the number of historical events confirming the revelations is persuasive, indeed stunning. Thousands witnessed the Miracle of Sun on October 13, an event quickly reported in detail by the secular newspapers but never convincingly accounted for by science. The children, anxious to know if they would go to heaven, were told that two of them, Francisco and Jacinta, would predecease Lucia. Both died while manifesting extraordinary holiness, Francisco in 1919 and Jacinta in 1920. As promised, Lucia would live on to spread the message and died as an elderly Carmelite nun in 2005. The second great war was preceded by the great lights predicted by Our Lady. The extraordinary and mysterious event of 1938 (New York Times headline on January 26: Aurora Borealis Startles Europe) took place a few months before Germany annexed the Sudetenland, effectively beginning World War II. Because of the devotion of the people, Portugal was never drawn into that war, just as Our Lady promised. In 1942, the Portuguese happily contributed their jewelry and fashioned a gold crown for her statue. Portugal did not take the Communist path in the 1970s, despite the political upheavals and many predictions to the contrary, again just as Our Lady promised. The mysterious and dread Third Secret was (probably) fulfilled by the assassination attempt on Pope John Paul II. He attributed his survival to Our Lady, and sent the assassins bullet to Fatima. It can be seen there, fitted into the crown of Our Lady of Fatima. But is it really possible for an army of rosaries to be successful in transforming the world? The Year of Mercy is about to come to end. What next? Why not a Year of Prayer and Penance in honor of Our Lady of Fatima during the 100th anniversary? Our need is great and suitable means at hand. Lets resolve to pray that Rosary daily and to encourage families everywhere to do the same.